I hope that you all had a fantastic holiday! Mine was great except for the fact me and the hubby came down with really bad head colds! I had something completely different planned for dinner and the only thing that sounded good was soup. Plus it was snowing all day. Perfect soup day. This soup was so delicious! It is an award winning soup and it is excellent. I loved the cheesy flavor and I loved that it was different than other soups that we had tried. It became an instant favorite and it made a lot so I am excited to have leftovers! This soup is insanely delicious! Made with fresh ingredients and topped with shredded cheese, you will make it again and again! In small skillet melt remaining butter (3 T) and add the flour. Cook and stir for 3-5 minutes or until bubbly. Add to the soup and bring to a boil. Cook and stir for 2 minutes. Reduce heat to low. Stir in the cheese, milk, salt and pepper. Cook and stir until cheese melts. Remove from heat and blend in sour cream. This looks so yummy. How much does it make ? there is only 2 people here.. I wanna make it now. Do you add the sour cream in before you freeze it or do you when you thaw it? I just got done with my first bowl. I made this just as you wrote it figuring I could modify it if I felt it needed it. This soup is easy to make, inexpensive, and delicious just the way it is. I may at some point try the bacon or ketchup ideas but wanted you to know how good it is just the way you wrote it, thanks. Now if you’ll excuse me, time for another bowl! Yummy. We’ve been making this soup since the 90’s. Always a go to on cold fall or winter days. Plan on making it tomorrow. So amazing with some fresh bread too! We used to make it with a recipe called “Dad’s Flat Bread” we also found in the Taste of Home magazine around the time this soup was published. I wish I could find that recipe again, it was the perfect pair for this soup. A bar that we frequent makes the soup but they use beef broth instead of chicken in it is awesome. I’m going to make this tonight and I’m going to use the beef broth and they use half-and-half instead of milk I’ll let you know how it turns out. You made me hungry talking about the bread. Can anyone speak to whether this soup freezes well ? I wasn’t sure of the potatoes and the cheese factor. Please let me know as soon as possible because I am about to make it today. The soup was perfect! I added some garlic to saute with the veggies and worstshire before I let it simmer just because I love that additional flavor. Loved the recipe! I’ve made this before and loved it! I’m making it again tonight. Do you think there is a way to convert it to the Crock Pot? Do you think it would taste the same? Made it today for lunch. YUMMY! I doubled the broth. Added 1/2 cup of cream and just used 1 cup of milk. Also used the suggested dbl where the writer suggests. The name does not do the soup justice! So good. 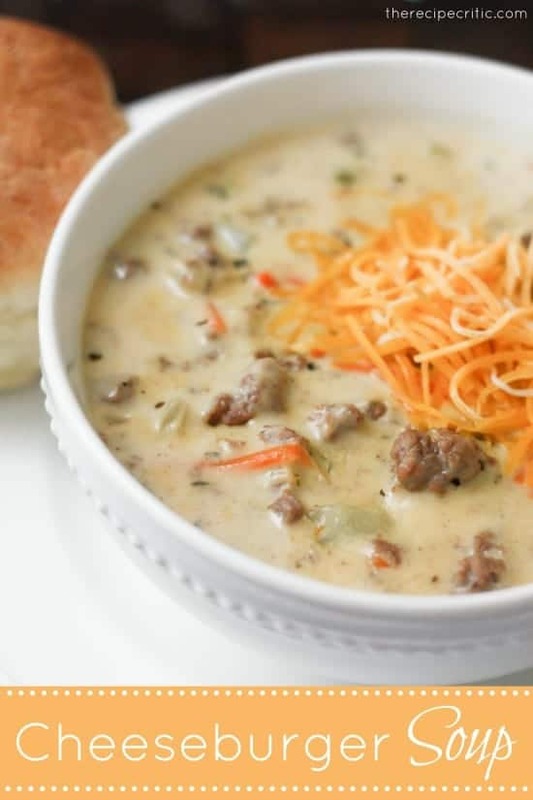 I have been making this Cheeseburger Soup from Taste of Home since it first came out in 1996. It has been a family favorite since then and is requested all the time! You can add more or less of anything in it. So easy! I was wondering if this soup will freeze very well. I like to make soup and freeze it in individual servings so when my kids get home, they can take out what they want and have a quick meal. I love making this soup, my family loves it! I like serve it with buttered rolls or bread, and some chopped fresh tomato, onion, shredded lettuce and even some chopped pickles to put on top. My biggest problem is making enough of it for our family of five because they devour it! It’s great for football gatherings too. Thanks for a favorite recipe! I made this for dinner for the first time tonight and I can officially say this is my new favorite soup. I am wondering if you have ever frozen the leftovers ? There are only 2 of us and it made a ton.. Thanks for the great recipe..
Can I make it in the crockpot?if so how long and do I add all the ingredients at the beginning? Yes, that sounds great! You will have it in the slow cooker for 4-6 hours on low. I’ve been looking for a Cheeseburger soup and came across yours. Have not tried it, but its looks delicious and i can’t wait. We love this soup so so much. I’ve made it for many friends and it’s always a hit! I never have celery so I just add a bit of celery salt. I also add a little garlic powder to the burger. Thanks for sharing this gem with all of us!!! I am eager to try this soup on my boys who refuse to eat soup of any kind. I clicked on the 3 quart sauce pan link, and it took me to my favorite website (Amazon), but unfortunately the link led to a jelly roll pan instead of a sauce pan. This soup is one of our family favorites for a long time now. It’s always in my soup rotation which is at least every 5 to 6 weeks. Our daughters both make this in there homes and LOVE it too. I usually add half velveeta and half extra sharp cheddar cheese. As it stands this is the day and we are making this delicious soup for dinner tonight and also going to make some homemade cheddar bay biscuits I found also to go with this….my mouth is watering just thinking about it…LOVE LOVE LOVE!!! THANK YOU Alyssa for sharing this recipe!!! I just made this and it is my favorite soup ever. I used heavy cream instead of milk and it is just remarkable. Thanks for sharing. This was a hit! We tried this last night but I did add about 2 1/2 lbs of ground beef a couple more cups of cheese (block of cheddar and shredded cheddar cheese), and I used Weber gourmet hamburger seasoning to add a little more flavor to it. Definitely will save this for later! Thank you for sharing the recipe! 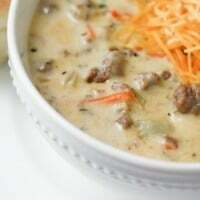 I just made your recipe for cheeseburger soup! I’m certainly going to try more of your recipes. This will be dinner tonight. I will let you know how It turns out. Can’t rate it yet but, I will. For baking: 7/8 cup buttermilk or sour milk plus 3 tablespoons butter. For baking: 1 cup yogurt plus 1 teaspoon baking soda. For baking: 3/4 cup sour milk plus 1/3 cup butter. For baking: 3/4 cup buttermilk plus 1/3 cup butter. It’s not vital to the recipe, just leave it out. I only ever put it in when I happen to have sour cream on hand, if not, no one even notices. So easy !! Very filling perfect for a cool fall night !! We had made this recipe before with potatoes which we love. But we’ve been trying to do low carb so my boyfriend suggested using jicama. It works and tastes great. A little sweeter but good sub. These are all ingredients I keep in my house. I doubled the recipe, because I have bottomless pits for children. They are 12 and 8. Both pitched in to help create this soup. We don’t really believe in measuring ingredients and it still turned out wonderful. It was absolutely delicious! I am adding this as a staple recipe in our house. It is filling and easy to make. This recipe was DELICIOUS and so easy! My family really loved it. Awesome comfort food . Great as written. Famiy loves it. I add a little crisp baon at times. I also use the shredded cheddar. This soup is amazing. I am typically not a “find a recipe & make it” kinda person. I followed the directions exactly and it turned out perfect. Thank you! Made this twice now and my husband lives it. He says its his favorite yet. I’m sorry, is it a pound or half pound of ground beef? Thanks! Are you allowed to make a modified one using the crockpot or can i just make it the same but add it to the crockpot instead of boiling it in the stovetop? This recipe was delicious! I used a pound of ground beef and 16 ounces of cheese. I will be making this again. I just wish it would let me print the recipe. I cooked this tonight and wow! My husband who is not a soup lover gobbled it up. Thank you for sharing this. So glad to have found your site. I can’t wait to look through your other recipes! Very good soup! I made it just as written using shredded cheddar cheese and will definitely be making again and again. Thank you for the recipe! This soup is really good. I have made it for years. I got the recipe from Taste of Home. Making this soup tonight! Can anyone recommend whether to use the Velveeta processed cheese or the shredded cheddar cheese? Turned out very well but we may substitute some pasta for the potatoes next time. Thanks for this recipe!! I made it for a company (https://rcre.com/) soup cook off and WON!! It is a delicious soup!! I did add a splash of Frank’s Hot Sauce and a sprinkle of Chili Powder — thanks for your delicious recipe! Delicious recipe! Does anyone know the calories per serving? Thanks so much! Has anyone ever substituted the potatoes for sweet potatoes? Wondering if that might be okay. Thanks for the suggestion and other ingredient idea! I love it. I am happy that you liked it. Thanks for following along with me!! Have made this several times. We love it! How many servings should it make? Made this tonight for my crew, and everyone loved it. I did sub low sodium beef broth because I didn’t have any chicken stock on hand, and it was delicious.